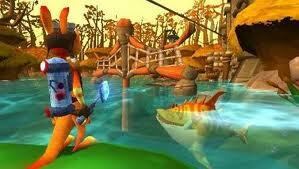 Daxter was the first jak game that I played. Chronologically it is the second game in the series but it came out after the trilogy. Even though the jak and daxter trilogy is heavy on the plot I got through the game without feeling lost. The basic story of the game is that Jak has been captured by the Crimzon Guards for yet unknown reasons. Daxter being physically incapable to overpower them, makes a retreat vowing to save Jak in "no time". As it turns out it eventually takes Daxter two years to rescue his friend and the game is all about how he spent those two years. Initially Daxter spends his days at the local bar telling his fabricated exploits to anyone willing to listen. He gives the men a few laughs but is never taken seriously. Until a gullible old man falls for his tales and offers him a job at the Kridder Ridder extermination company, the only establishment left to fight bugs in Haven city. Thus Daxter begins his adventure to rid the city of infestation and try to find a way to save Jak in the process. Daxter follows a mission based approach to it's game play. You go around the city talking to people and help solve their bug grievances. In the city you are free to roam any where you like. There are lots of precursor orbs to collect so it pays well to explore every nook and cranny of the levels. Accepting a mission usually leads to a "dungeon" where you have to fight off insects that have in one way or other disrupted the functioning of that place. While this may sound too simplistic, there are actually a lot of things to do in a stage. Like the precursor legacy Daxter is a platformer. In addition to jumping and doing other standard platforming stuff Daxter is armed with bug sprayer that he can use in a variety of ways. He can use it to ward off bugs, he can use it hover over platforms (which is very helpful in getting to out of reach orbs) and later he can also use it as a flame thrower and a gun. Much time is spent on using the bug spray creatively to either collect all the orbs or to clear a stage. Besides platforming there are also some vehicle based missions which are quite well done. A lot better than those in Jak 2. But the most engaging part about the game besides main quest are Daxters dream missions. Collecting enough orbs open up a dream sequence where Daxter imagines himself to be in role of a popular movie star. You will get to play him in his dreams as Neo, Gandalf , Braveheart and Indiana Jones. These sequences are very engaging and funny though they can be a bit tough. Earning gold medals on these missions will earn you more health and orbs. Jak games have always had a curious mix of technology with pastoral simplicity and Daxter is no exception. In a city with underground electric trains, hover crafts and power grids there are also places like the lumber mill surrounded with natural beauty. You can almost breathe the fresh air of these stages. This contrast among the levels makes replaying them more fun than it would have been otherwise. Eventually Daxter comes closer to rescuing his friend and the levels take a somber turn. Though it has absolutely no effect on Daxter's sense of humor. In one such level he adopts his own sidekick, a flea which he names Tik, which unfortunately dies in a few minutes, to slight distress of Daxter. Moments like these kept the atmosphere light and never failed to bring a smile on my face. Those who already played Jak 2 before Daxter will know where it all is headed. They may also recognize some areas in haven city. Regardless they should still play Daxter because in my humble opinion it is one of the finiset 3D platformers made and the one that stays true to the spirit of the original game more than it's sequels ever did. It one of those games that made psp a home for sidekicks.